I spent this weekend working on revisions for my WIP. Unfortunately, at this stage that means starting from scratch and writing rather than revising so things are going much slower than I’d hoped. But I’ve noticed in just looking over what’s already there, that I’ve subconsciously used color in certain scenes to evoke the mood I’ve been looking for. Color psychology is rather fascinating, and I’m sure we’re all familiar with the basics – Red is a power color, blue is relaxing, that sort of thing. But it made me wonder – since novels/stories are a non-visual medium, how can we use that in our own writing? Below is a list of some common colors and their meanings. But I’ve also tried to offer some suggestions as to how they can be used to enhance a scene or character. Stories might be non-visual, but I know as a reader I have a picture in my head, and color, used judiciously can make a huge difference in how I perceive a scene. Black: A color of authority and power, and also evil. Why is it that villains are always dressed in black? Or scenes start out on a “dark and stormy night?” You can use black objects, clothes, or other items to hint that this is a dark or evil area or person. White: Innocence and purity. But also sterility – as doctors and nurses wear it to imply cleanliness. Another subconscious cue that the item or person you’re describing is pure, or the hero. Or perhaps just OCD. Red: An emotionally intense color, a power color. Use it to highlight something that would otherwise be missed or is important in a scene. It’s an easy way to bring intensity to an object. A red door implies something completely different than your standard wooden door. Blue: One of the most popular colors, it invokes relaxation and peace. It also increases productivity and implies responsibility. There’s a reason psychologists recommend wearing blue suits to interviews. Use it as the signature color of the responsible sidekick, or during a “breather” scene to lull the reader into a sense of calm before the big storm hits. Green: Another relaxing color, one that implies the natural world. It’s the easiest color on the eye and can relax the muscles in the eye. Brides in the middle ages wore it at their weddings to symbolize fertility. Modern day, we associate it with wealth and money, but also ecologically friendly or natural. Yellow: Can be overpowering if used too much, but it does increase concentration (why legal pads are yellow). It is an optimistic color, but it can also cause people to lose their tempers. Yellow is a distinctive color that can show wealth and power, as well as a cheerful, good nature. Purple: The color of royalty, it invokes power and wealth. It can be a bit cliche now, but many characters in power wear purple robes or gowns for a reason. Used to describe an item of clothing or something in a room, it can imply the character is of higher class or powerful. Brown: A solid, reliable color. Typically it blends into the background, lends stability to a scene. Another good color to imply reliability and trustworthiness. 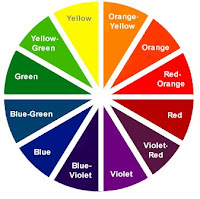 These are just some generalizations regarding color, but I think they can be helpful in visualizing a scene and layering it with additional meaning. Pay attention to the colors you use and I think you’ll be surprised at what readers gather subconsciously from a scene or person! Intriguing idea! It reminds me when I was watching commentary on a movie (I think it was Hellboy), the director commented on how they lit each scene in a specific color to convey mood and atmosphere, etc. I'd not noticed it consciously, but now I do and I like it. I also adore the movie Hero (w/ Jet Li) and how it uses colors to help tell the story. I've found that fascinating. I am a big fan of color symbolism. 🙂 It definitely sends messages to the reader and can set the tone or mood. Merc – I love Hellboy! And I'd never actually noticed the color thing – I'll have to go back and watch for it. And check out Hero too! Very interesting – I've heard of color psychology before but it's neat how you applied it to scenes. The most striking use of color that jumps to my mind was in the movie Schindler's list. I'm not sure if I can recall any memorable use of color in a book. But I'll be on the look out now.